PLEASE CONTACT THE GALLERY FOR PRICING. A wonderful modernist view of what is certainly Fisherman's Wharf, San Francisco. Signed recto 'P. Douglas Anderson ARPS' with title and various exhibition stamps verso along with three photographer's stamps indicating three different addresses. 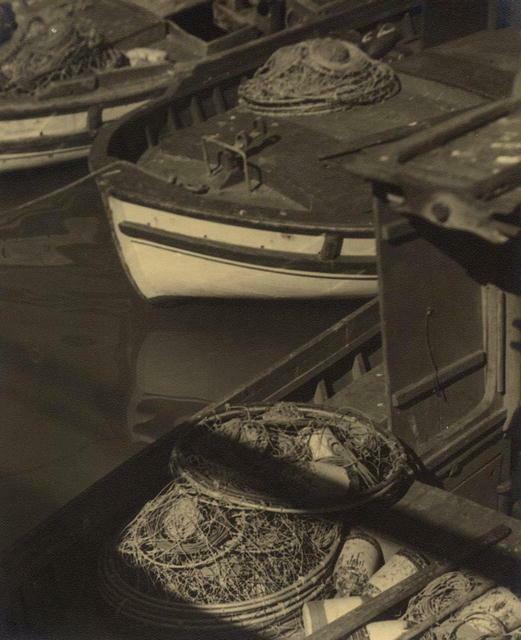 P. Douglas Anderson, active in California c.1910s-1940s, was affiliated with the Pictorial Photographers of America and the Camera Pictorialists of Los Angeles. In May 1923 he was appointed Associated Editor of Camera Craft, and briefly served as the magazine's Editor-in-Chief in 1924. Between 1918 and 1935 he participated in over 30 salons, including exhibiting three photographs in the Fifth International Exhibition of Pictorial Photography at the California Palace of the Legion of Honor in 1928. His work is held in the collections of the Oakland Museum and the San Francisco Museum of Modern Art. Items Similar To "P. Douglas Anderson: The Crab Fishers"